Bryn Davis got to know Neskowin — a small, unincorporated town on the Oregon Coast — as a child, traveling often with her parents from their southeast Portland home to a rental condo overlooking the beach. Last fall, she returned as a UO graduate student in landscape architecture with the eyes of a researcher: What if a Cascadia earthquake happened? 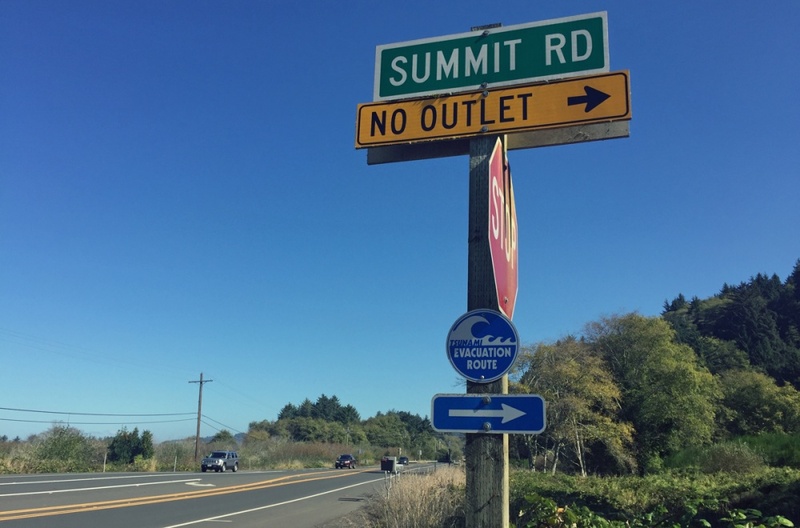 Could evacuation routes from an ensuing tsunami help with the resilience, the ability to recover from adversity, of the Tillamook County community? Her visit, a study of GPS data, a dive into research about resilience and phone interviews with officials led to an 89-page paper. 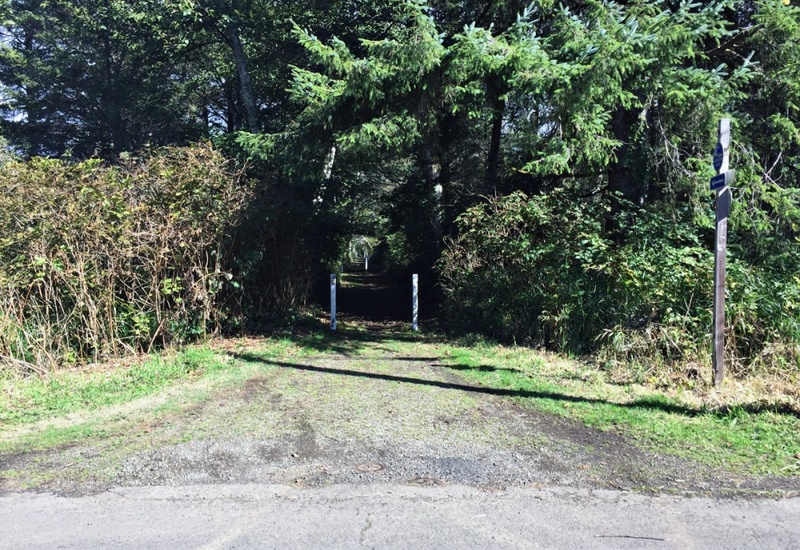 It identified trouble spots and suggested improvements to an unpaved, obstacle-laden pedestrian escape trail through a wetland. The last major Cascadia earthquake occurred in January 1700, during the rainy season. 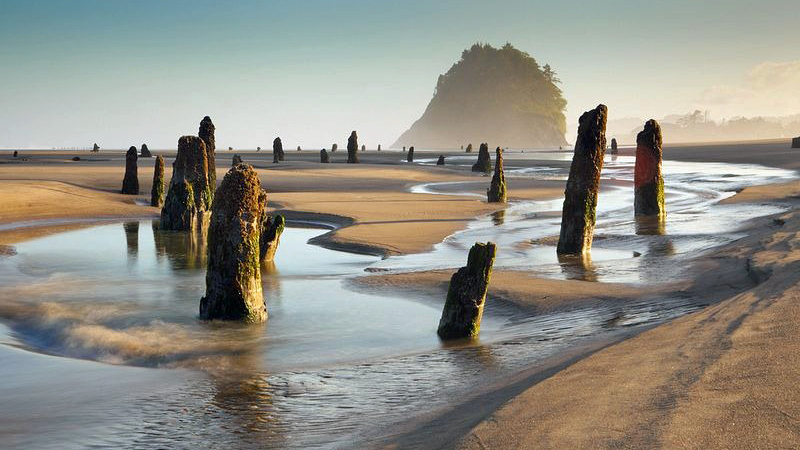 Near the iconic, tree-covered Proposal Rock just offshore is the Neskowin Ghost Forest, where that earthquake or ensuing tsunami buried 2,000-year-old trees in mud. The stumps became visible during winter storms in 1997-1998. Her paper, which capped off a master’s degree that was awarded in June, noted dead-end streets, insignificant lighting, steep slopes and little room for pedestrians on marked evacuation roads. Coastal towns in tsunami zones, Davis said, need to put their evacuation routes into their community psyche. Art walks, runs, cultural activities and local history along the routes could entertain and educate residents and tourists about their escape options. State agencies have mapped evacuation routes for worst-case scenarios. While maps are available online, many people don’t carry printed versions, Davis said. If an earthquake takes out cellphone towers and WiFi access, they won't have access, she added. Her project could serve as a guide for many coastal communities, said Chris Enright, Davis’ adviser, a research associate in the Institute for a Sustainable Environment and an instructor in the Department of Landscape Architecture in the College of Design. “Although Bryn focused on Neskowin, the approach she developed could easily be adapted by other communities to identify opportunities to incorporate community resilience with their disaster planning,” Enright said. For the wetland trail, Davis proposed three adaptations: a 600-foot boardwalk corridor, topped with a pergola, from the path’s entry point to where it meets pavement; a series of markers on the path that detail geological and tsunami history in the area; and a sculpture marking the hikers' arrival in the safety zone. Under her design, the walkway would be widened to a width of 8 feet, with a bridge over Kiwanda Creek being replaced as part of the boardwalk to assure access for wheelchairs and swifter evacuation. The path would be lit with solar-powered lamps for nighttime navigation. A pergola, possibly in a second stage of construction to spread out the costs, would go above the boardwalk to help stabilize the structure during an earthquake and prevent fallen trees from blocking the route. At trail’s end, Davis proposed an assembly area canoe sculpture, reflecting a local Native American story in which elders urged people to weave ropes for tethering their canoes to trees to ride out the waves. Other communities could choose trail markers and structures that reflect their local history. “The tsunami narrative markers and assembly area canoe sculpture address the goals of being easily located, psychologically and physically navigable, increasing familiarity and engaging the community in learning about Oregon’s history of tsunamis,” Davis wrote. Resilience is the heart of her paper, Davis said. That meant understanding how the term is defined and applied. She chose to use a framework that allowed her to place resilience strategies into three compartments: engineering, ecology and psychology. Her guide was a 2014 paper led by Paulina Aldunce of the University of Chile and University of Melbourne. The design proposals, Enright said, allow for possible implementation over time. Her motivation to look at Neskowin’s vulnerabilities, Davis said, drew from her childhood familiarity but also from hearing about the Cascadia threat in 2002 while a student at Portland’s Benjamin Franklin High School. Upon graduation in 2004, Davis, headed to Kalamazoo College in Michigan to study art and art history. She spent four months in Rome. She returned to Oregon and worked part time for three years in an outdoor environmental education program in Portland and teaching art in Beaverton. That led her into the landscape architecture master's program, she said, because of its emphasis on ecological processes and sustainable design.